We are unique in the massage table industry. You will not see us at trade shows or in retail outlets -- you have to search us out. We limit our magazine advertising to just a few publications. We build bodywork tables that advertise for us. Each one is a reflection of our commitment to making the highest quality massage table available. Because we do not have traditional distributors, we are not paying someone to promote our bodywork tables and accessories. Our massage tables promote themselves. We offer a number of different models of bodywork tables and a variety of accessories. 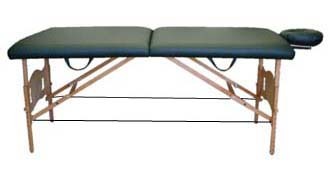 Our massage tables are unique because of our "Locking Pin" brace system. A "Locking Pin" system insures that the bodywork table is stable while a person is on or off our rock solid tables. Our brace system is 100% more stable than the "Pop-Up" massage table. Professional massage therapists prefer the rock solid feeling that comes with our "Locking Pin" system. Typical mass-produced "pop-up" table after a few years of continuous use. Robert Hunter table after many years of continuous use. Our goal is to build bodyworking tables that last. We are dedicated to research, development and production of tables that stay solid and quiet after years and years and years. We are known for our custom handcrafted work and massage table designs that meet our customer's requirements. We take time to listen to you and what you want. It's exciting to design a new bodywork table for a unique use. We offer a prenatal massage table that is used by massage therapists working with pregnant women and our portable salon tilt-back is used in the skin care and spa industry. We also have tables that are designed specifically for Reiki, Feldenkrais, Rolfing, Lomi-Lomi and Trager.